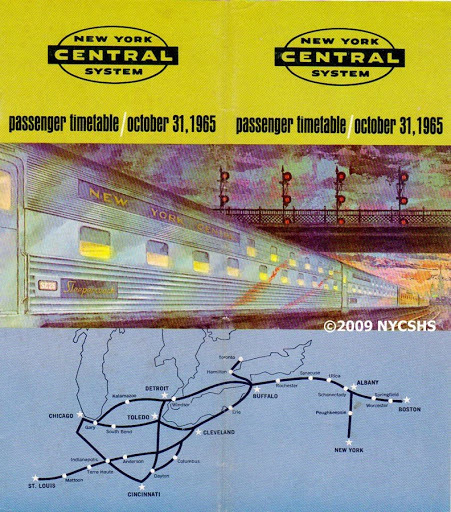 Through the 1960s, the New York Central was preparing for merger with its archrival Pennsylvania Railroad. 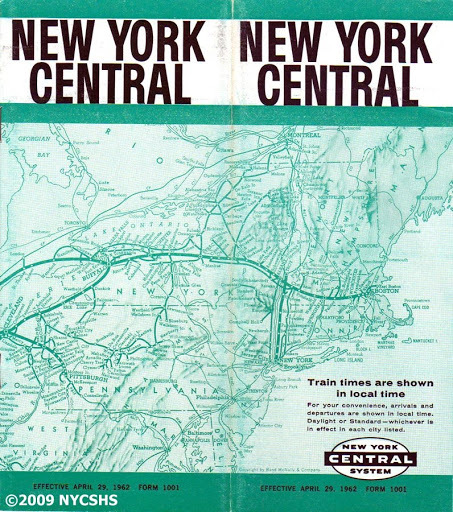 In an attempt to be viewed as a more modern mode of transportation, the railroad experimented with many cover designs for its system timetable. Here is Form 1001, effective April 29, 1962. The illustration is an older style map that continues to wrap around to show the western part of the railroad. Here is the portion of the April 29, 1962 timetable that wraps around. 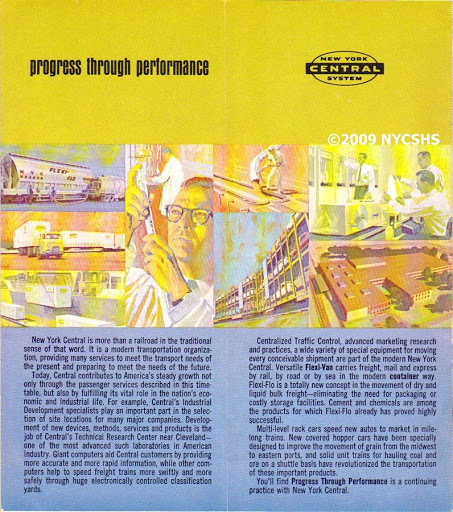 The top of the page contains an ad for New York Central’s revolutionary containerized freight “Flexi-Van” service. Unfortunately, the railroad was about ten years too early for the containerized freight revolution. 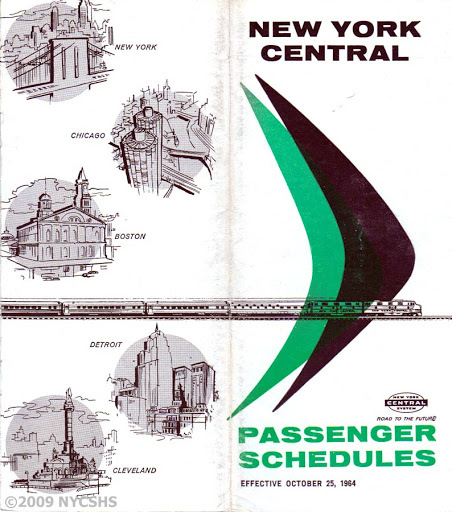 The Central experimented with futuristic looking arrows, suggesting greater speed for an illustration of a passenger train pulled by two F-units. A drawing of a Sleepercoach (note the window arrangement) is clearly seen behind the locomotives. 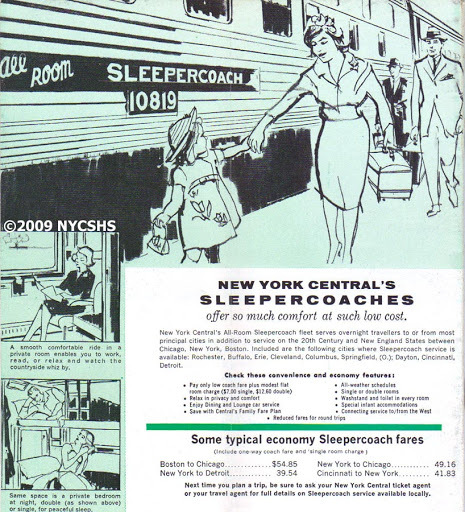 The October 25, 1964 edition also contained a full page ad for “Sleepercoach” travel. Sleepercoaches made their first timetable appearance in late 1959. They were advertised in the inner folds of the timetable. At this time, the 20th Century Limited and the Commodore Vanderbilt were operating as a combined train known as Century/Commodore. Sleepercoaches were also operated on The New England States. They were configured as 24 single room/8 double room cars. 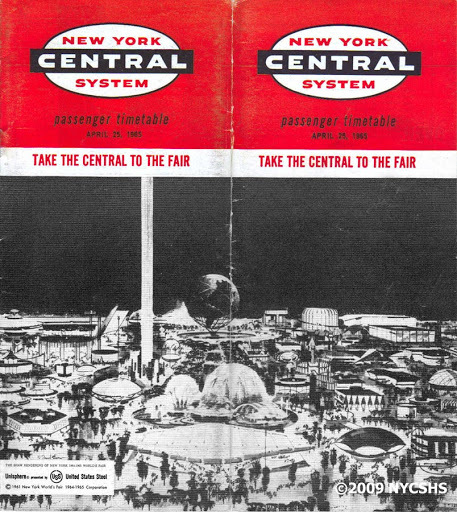 The New York 1964 World’s Fair is the dominant theme for the April 25, 1965 timetable. The Pennsylvania Railroad had the direct route, though, thanks to its subsidiary Long Island Rail Road. By the mid-60s, the concept of the World’s Fair was beginning to ring hollow with the public. 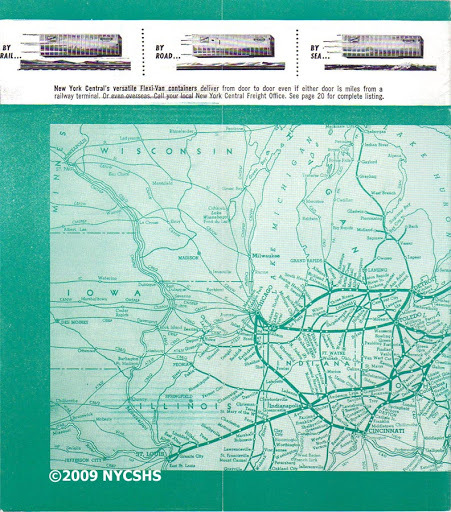 An illustration of speeding Slumbercoaches over a simplified New York Central map are the theme for October 31, 1965 edition. The purple and yellow colors were a departure from earlier somber colors. The new simplified system map would make many appearances both inside and outside the timetable in future editions.